Every now and then you find someone who sets the bar a little higher than most. That someone is Chris Trahan. Hydrovac Nation had the honor of accepting Chris’ request to join in November 2016. Chris, along with many of our members, has done some extraordinary things. But this month we wanted to highlight Chris just a little more. Chris is originally from Victoria, BC, but found his way to Ontario where he worked for Graham Utility Hydrovac Services until just recently when he and his beautiful family packed up and headed back west! 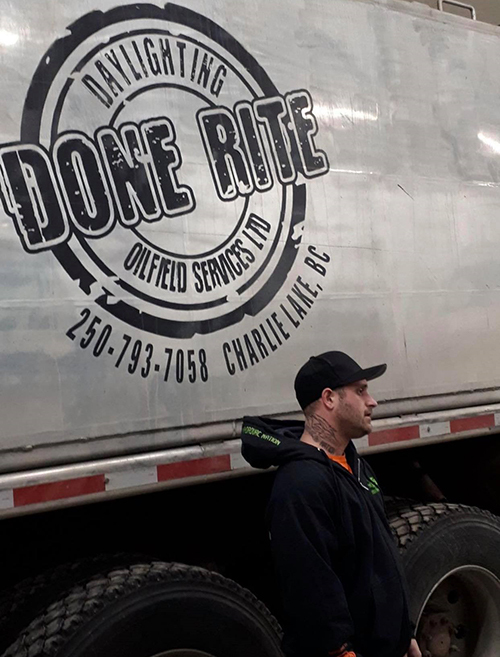 He came back to BC to join Clayton Thompson and his crew at Done-Rite Daylighting in Fort St. John. Back in March of 2018, Chris heard about a little girl that was very sick and needed help with some medical bills. This little girls name was Amelia. Chris decided to do what he could to help and Amelia’s Army was born! The challenge was made to the members of Hydrovac Nation that if a minimum of $2500 was raised by March 14th, Chris would get the Hydrovac Nation logo tattooed on his neck! Through everyone’s generous donations the goal was not only reached but surpassed! A date was set and soon the Hydrovac Nation logo was forever inked onto the neck of who could arguably be the most dedicated member of this great group of people. As we all know it takes a curtain type of person to do what we do. As a business owner, you want your employees to have the same desire to appease the customers as you would. The idea of Building a team that doesn’t just do a good job, but compliments the Company as a whole, is what we all strive for. Through Hydrovac Nation, Done-Rite Daylighting has gained some true professionals from across the entire Country. I’d like to give notice to Johnny Foster and Peter Matheson for their desire and initiative of wanting to join our team. They changed their entire lives to be a part of a new adventure and I am very happy to have welcomed them our team. We certainly gained a couple of true professionals! With our growth, we had room for another team member and the search began. With some suggestions from my guys and some research on Hydrovac Nation, I met our newest team member. Chris Trahan. Chris went out of his way to help a deserving family by encouraging the Nation to donate and raise funds in support of their sick little girl. By meeting, and exceeding the goal he set, Chris agreed to have the Hydrovac Nation logo tattooed on his neck! A symbol of our brotherhood to some of the most badass men and women on the planet. Along with the Nation, I would like to give recognition to my entire team and to give Chris Trahan some well-deserved recognition and appreciation for being not just a great team member, but for also being a great man. On behalf of our family at Done-Rite Daylighting, we thank you. Members like Chris do not come along every day and we are honored to have him within our group. Chris is an example of what we all should strive to be. Aside from what Chris has done to help a little girl he didn’t even know, we want to thank him for being a productive, passionate and active member of Hydrovac Nation. Chris is always willing to lend a hand, answer a question and make constructive, relevant posts. On behalf of the Hydrovac Nation administrative group and all our members, congratulations Chris, you truly deserve this!